I am so excited to be sharing this special post on the blog today! How could I not be?? 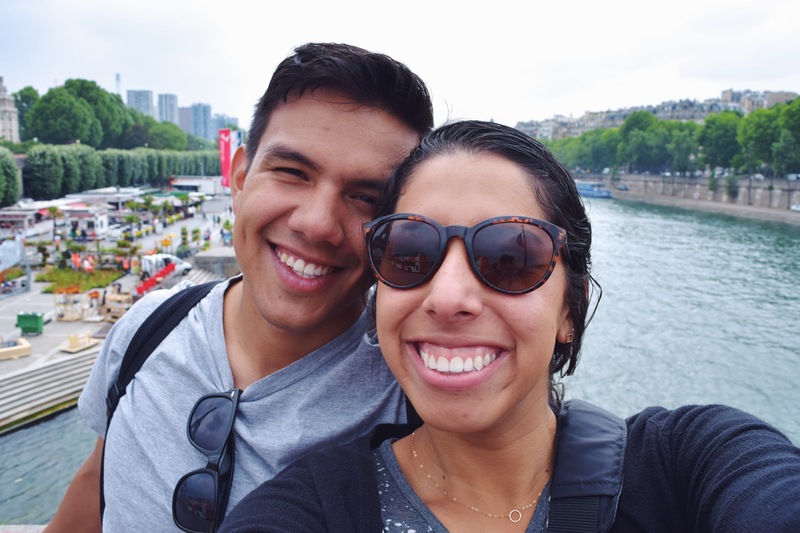 I know I had said I’d be blogging our trip from the beginning, but after many requests and just being so ready to write about our big moment, I decided I’d be taking a little detour to Paris first. Eric planned the absolute perfect engagement and I am so happy to not only be sharing it with everyone, but also preserving the moment for myself. 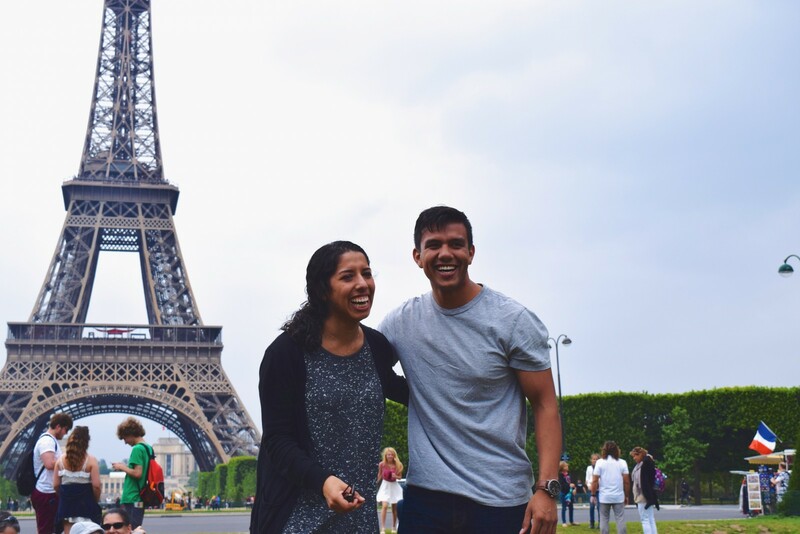 It happened on our first full day in Paris, and the craziest part of it all might be that I actually had a dream that we got engaged that very night before it really happened. Crazy, right?! 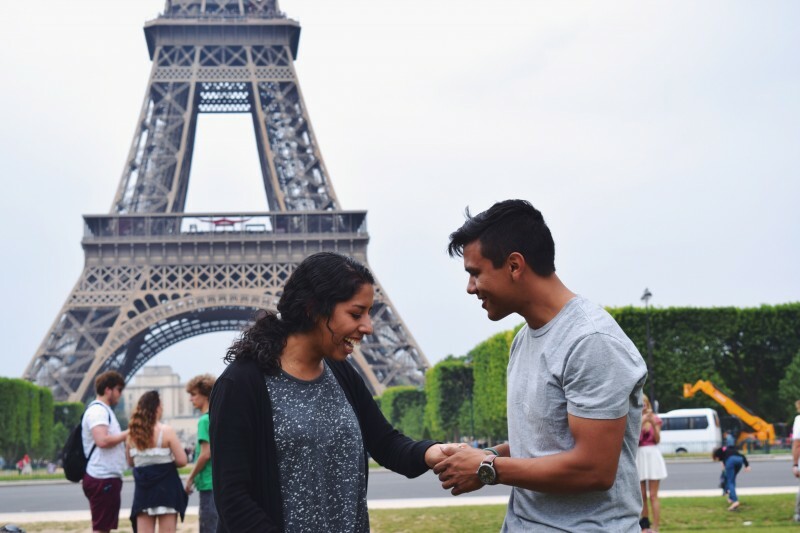 I can’t remember the exact setting, but I know it definitely wasn’t the Eiffel Tower. That morning as Eric and I made the transition from the hostel we stayed at for a night to the first airbnb with a killer view we had booked for the week, I told him all about it. Then of course he shared a dream he supposedly had about zombies or monsters or something, a typical boy dream of sorts. And the whole time, even directly after I mentioned my dream, he didn’t flinch or show or a single sign! I look back now and I’m amazed. 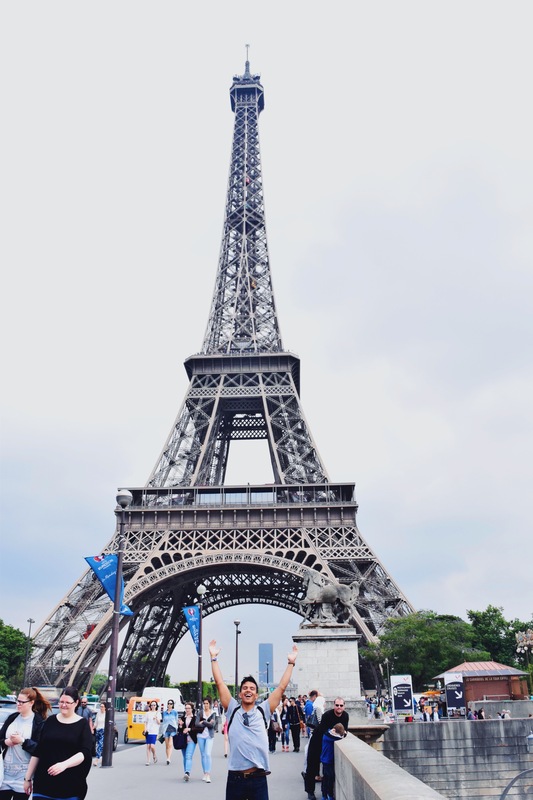 After settling into the airbnb, we set out to the market across the street to pick out a bottle of wine and some sandwiches because I really, reallyyyy wanted to have a picnic at the Eiffel Tower. I had been talking about having one since we left America. (Fun fact: Wine is cheaper than water in Paris. Oh that leads me to – is it time to go back yet?) Later, after the engagement happened, Eric told me he thought our picnic would be a day or two later in the week, but when he saw that I was ready to go and see the landmark I had always dreamed of, he knew he’d be doing it that first day – I guess there was some surprise in it for Eric too! 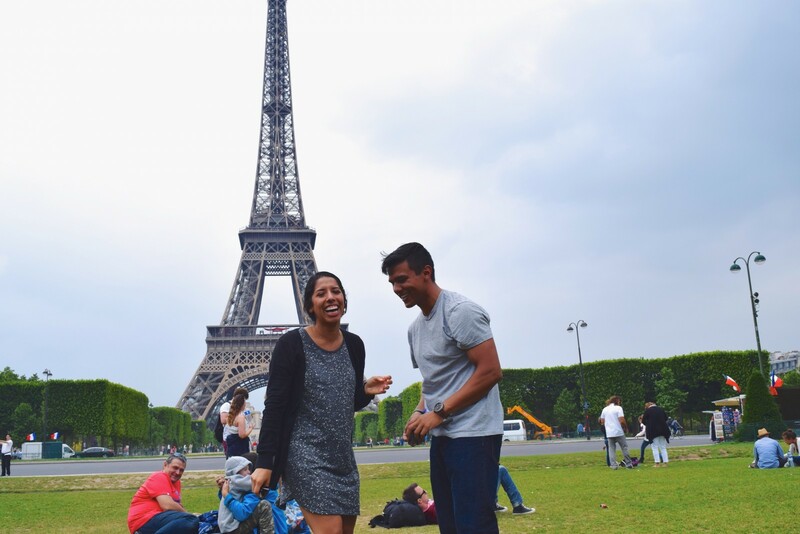 We picked up a bottle of champagne at the market and a couple of panini (what they call sandwiches in Paris I learned), and did the short walk to Eiffel Tower Park. There is a grassy area on each side of the tower. We sat down to eat on the smaller side next to a fountain area. I was in total awe the whole time of how beautiful the whole scene was! Once we finished our panini, and the bottle of champagne, a gentleman asked if I could take a photo of him and his family, and I asked if he would take one of us after. The funny thing was that he took the photos of us crooked…it was the weirdest thing! At first we thought it was a joke, but once we saw his little boy take a photo that way too, we realized it might just be how they thought regular photos are done. We thanked the man for the photos, I took a few more of his family, and then Eric and I picked up our trash to keep moving. We laughed reflecting back on how odd the whole crooked photo thing was, and snapped some more photos ourselves as we crossed a bridge that would lead us to pass right under the tower, and onto the much larger park area on the other side of it. Little did I know, we were snapping these pictures just moments before he’d be popping the question. Once we walked far back enough in the larger field, we decided we wanted a better photo together in front of the tower…so I guess those crooked photos worked in Eric’s favor – they helped his case in making sure we posed for more. When we had asked for photos together thus far, I had just been giving trustworthy looking people my phone, instead of the nice Nikon camera we had with us. I didn’t want anyone to steal it of course, but the Nikon was also proving to be intimidating to people who weren’t really sure how to use it. This time Eric suggested we give the Nikon to a nice looking couple that was sitting down with their own picnic and Nikon camera at their side. I didn’t want to interrupt them since they looked like they were in their own moment, but Eric insisted. I asked, and told the couple I could take a photo of them together after as well, and the kind man said of course. So I turn around, and Eric is fumbling around in the daypack we had, and I’m saying, “Hurry Eric! He said he could do it!” and waving around, because I don’t like to inconvenience people and I didn’t want to take up the couple’s time with waiting on us. 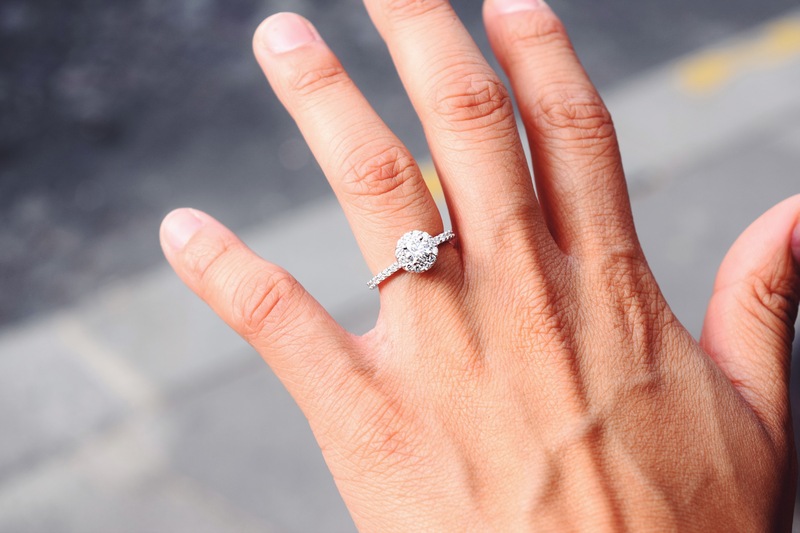 We hug for awhile and I’m saying “I can’t believe it” and just totally gushing over the ring because it is absolutely, amazingly gorgeous. This family behind us is all smiles and taking photos, and we here a lady shout out, “OH MY GOD CONGRATS!” All the while that random kind sir over there is snapping away some great pics! Seriously, that couple was totally random. 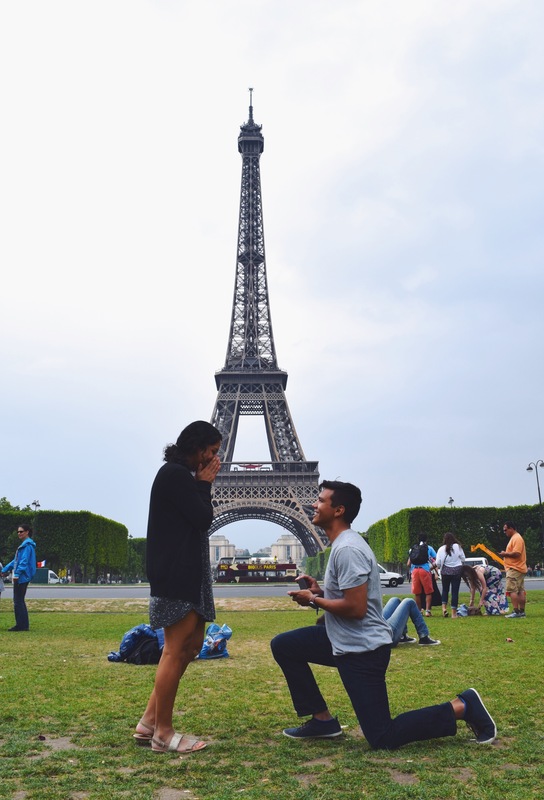 I can only imagine what was going through his mind as he got all set up and thought he was taking a normal couple’s photo, and all of a sudden a freakin’ engagement is happening through the lens before his eyes! He’s probably like, “um so can I add this to my portfolio?” I wish we had their contact info, we owe it to him – he did an amazing job! 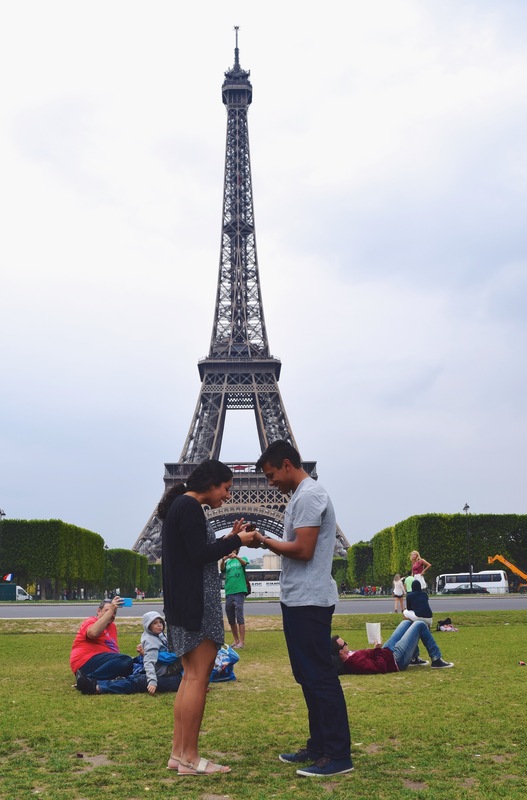 Afterwards, I kept my offer, and was fumbling around with their camera, trying to calm my giddiness, so I could take their shot in front of the tower. We thanked them, walked off a little from the field, and stopped to say a prayer, thanking God for this perfect moment and each other. It was only after this, when Eric told me how he asked my dad for his blessing and what a great conversation they had – did my eyes start to water a little. No full on tears though. Just endless smiles and hugs and an overwhelming feeling of gratitude for this wonderful man. We continued on to our next stop of the afternoon, the Arc de Triomphe, but did stop on the way to enjoy a celebratory glass of wine! That night we skyped our families and some close friends. It was honestly the most perfect day and I couldn’t feel more thankful for all the support we have received from everyone, and the fact that I get to spend my happily ever after with Eric!